After great success of creating YU brand by Micromax and overwhelming response form the users YU was seems to be in mood to launch new inline device under it. 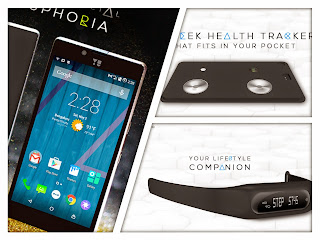 After long speculation and rumors today YU Yuphoria and YUFit and HealthYu Cassette launched in India. Here are quick updates and specs about today’s event. Since long time back YU on their forum taking suggestions from their followers for new upcoming device of YU family. This is second device launched by YU and made in India. This device is launched to get in competition with low range model like Lenovo A6000 and Lenovo A7000 Redmi 2. You Yu Yuphoria come under price tag of 6999. Well while talking about looks of phone it comes with metal body. Its design also differs from other smartphones looks like some old classic design. It comes with 5 inches IPS display with 720 X 1080 pixel of resolution having cornering gorilla glass 3 protection. YU Yuphoria powered by 64 Bit Qualcomm Snapdragon 410 clocked at 1.2GHz. It also comes with 2GB RAM memory and 16GB internal memory with option of external SD card option of 64GB. This handset also supports dual SIM with 4G LTE support. Well YU has first impression as for its excellent camera quality so we can also expect same this time. It has 8 megapixel rear camera and 5 megapixel front camera. As we have seen last time, Yureka was suffering for small battery but looking at this device config battery seems decent. It has 2230 mAh that also comes with fast charging. This device will be available in steel with Buffed black and Champagne gold with white. Every smartphone manufacturer is coming out with smartwatch and smart band. Recently Xiaomi has launched its MI Band and now YU have also launched YUFIR band. This band comes with OLED display that show how much you have walked, track your sleep also alert you about incoming calls and notifications. YUFIT stay synch with inbuilt YUFit app comes with YU phones and provide feedback on data collected by YUFIT. This fitness band is priced exactly same as MI BAND at Rs 999. While on the other hand YU has also introduced one small live ECG device that measure body vitals like ECG, skin temperature, blood oxygen saturation, heart rate and respiration rate. It announces as open device and can work with any smartphone. All data collected by these 2 fitness devices are said to be stored on cloud. This YU Cassette is priced at Rs 4999. So here is all about YU product launched in Delhi. Stay tuned for latest updates. Have some suggestions or queries comment below. Thanks for reading.